The effects of climate change are increasingly causing conflicts over available resources between nomadic herdsmen and sedentary farmers. Together with Helvetas, Ethiopian herders are looking for new ways to secure pasture and water for their herds. As a result of a severe drought, the project had to start its activities with the provision of emergency relief. Cattle herding is a mainstay of the Ethiopian economy, accounting for one fifth of the country’s gross national product (GNP). And yet nomadic herders are marginalized by the government’s agricultural policy. Climate change, overgrazing and the resultant soil depletion are making life even harder than in the past for nomadic herders. More and more conflicts are arising between herders and sedentary farmers. The Borana project, named after a well-known pastoral region in southern Ethiopia, protects cattle in case of disease or a shortage of feed. The project restores damaged pastures, champions women’s rights in this traditionally patriarchal society and creates opportunities for additional income sources. Because the project launch in 2016 coincided with the worst drought in over 30 years after the El Niño climate phenomenon hit the country, Helvetas and its project partners had to undertake an emergency response first. The project supplied the herders with hay, concentrated feed and veterinary drugs for their cattle. As part of a cash-for-work program, they restored water ponds and cattle troughs. Although the 2016 drought was comparable with the great drought that caused widespread famine in the mid-1980s, very few people died as a result. This was thanks partly to international aid organizations, but also to the Ethiopian government, which has set up emergency response systems and procedures to ensure that relief rapidly reaches those who need it most when disaster strikes. There are no specific emergency plans for Ethiopia’s herding communities. But Helvetas’ emergency response, which was rapidly decided, reached 3,400 households or roughly 20,000 people. This emergency response now turns out to have laid a solid groundwork for the original project of supporting herding families in Borana. Water ponds for cattle troughs created the first sustainable values – and broke down the herdsmen’s traditional scepticism about outside initiatives. 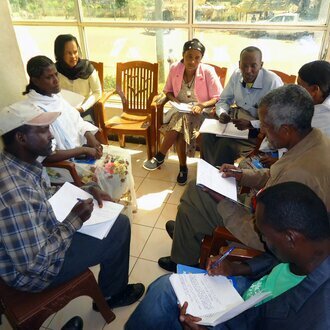 This project is an SDC mandate implemented by Helvetas in a consortium with German NGO Welthungerhilfe. Learn how farming families in Ethiopia cope with climate change and how young people improve their income through training. Yezina will not let her disability get in the way: she wants to be a successful tailor who carries her life in her own hands. Have a look at our portrait.